In the author’s opinion it is absolutely imperative for the sincere adherent of Eurasianism to embrace two fundamental moral tenets above all others: (1) Love for his Civilization (people, culture, soil, etc.) and (2) Hate for those who seek to destroy his Civilization. In other words, the Eurasianist must reserve his hatred exclusively for Global Atlanticism – the chief Adversary of all aspects of Tradition in the postmodern era. Now, it must be said, that this uniquely Eurasianist hatred does not translate to mean hate for other races, as indubitably the liberal advocates of Global Atlanticism will so readily suggest. If anything, the true adherent of the Neo-Eurasianist philosophy appreciates the beauty of the human species in all its diverse manifestations simply because Eurasianism (unlike Global Atlanticism) is based on the fundamental belief in a multipolar world order – to wit, Eurasianism is based on a fanatical and uncompromising love for human diversity and therefore seeks to construct a world order which reflects that diversity. The Eurasianist understands that without human biodiversity, the human species is doomed. This great endeavor of ours is therefore an endeavor of love. As the great Nietzsche declared in Aphorism 153 of his classic work Beyond Good and Evil (1886): “Was aus Liebe getan wird, geschieht immer Jenseits von Gut und Böse.” Translation: “What is done out of love always takes place beyond good and evil.” On that basis alone, the adherent of Eurasianism must fully embrace the fact that his philosophy of life – his love for his own civilization and the civilizations of others – is far beyond the fluctuating concepts of “good” and “evil” and thus far beyond the ideological simplicity of the Manichean conception of things. True, in all things the Eurasianist is one who strives toward the light and thus toward that which is opposed to darkness. However, the Eurasian revolutionary is also one who understands that love transcends both light and darkness. His love – which is to say his entire revolutionary effort – does not and cannot accept either the decayed present state of affairs or the hopeless sentimentality of the days of yore. No, this man’s love can only be found in his perpetual struggle to overcome all aspects of the decadent world he sees around him and yet also within him. In this sense, the Eurasianist is fundamentally a warrior – one who is above Time, against Time, and in Time. Here it is essential for the Eurasianist to accept the principle of ruthlessness if he is to achieve his primary collective goal of destroying Global Atlanticist hegemony. Hence the Eurasianist must understand that the ends justify the means, and also that the means add value and sanctity to the ends. The Eurasianist is therefore, in a word… ruthless. He is ruthless in his war against the liberal culture-destroying enemy and ruthless in his defense of Tradition. If the Eurasianist is a Russian by nationality, he must strive to overcome the limitations of his nationality by becoming something even greater: a Eurasian – or as an ascetic might put it: one who is molded in the Image of God. Indeed, the Eurasianist is one who strives toward godhood in all things, even if he is an avowed atheist! It is not enough for him to possess Russian nationality and Russian features – these traits are effortlessly inherited and do not reveal either his character or his own achievements; they say nothing of his own history of Struggle and Overcoming. The true Eurasianist understands that to be Eurasian on the inside (in the spiritual sense) is far more important toward achieving one’s destiny, yet far less easy than simply being born into a particular ethnos or nationality. The Eurasianist is a man of Blood and Spirit, Sacrifice and Transcendence. While it would be wrong to say that he does not care for the physical world (his people, kin, homeland, etc. ), he is overwhelmingly a creature of Spirit. If he is to sacrifice himself for an Idea, he knows he will become stronger, transcending the physical realm – he will become supernatural, Nonhuman, no longer bound by the material world. He will become indestructible. And so, to die is not the worst possible scenario for the Eurasianist. The absolute worst scenario is living on one’s knees (committing a form of “living-suicide”), submitting to any humiliation in order to preserve one’s eventless life; living for “fun” instead of purpose; looking to be “cool” instead of deep; prizing all that is subject to decay and stink and rot rather than esteeming the unseen, eternal, profound, ideal realm of the Spirit. Death is therefore a rite of passage for the Eurasianist. Death is not the end but the beginning of a new form of existence or consciousness. And there can be no greater joy than to die a warrior’s death – sacrificing one’s own individual body in order to preserve the collective Body of the People. The same way a single raindrop sheds its form to help sustain the vegetation of the broader natural environment, a warrior must sacrifice himself to sustain the broader community. Thus a warrior’s death is the one Supreme Honor that has the power to redeem any and all past transgressions that one might have committed in life. This is why the Eurasianist is one who fights on to the bitter end. Even if a Higher Power should, hypothetically, tell him point blank that no matter how hard he fights, he shall always fail in his endeavors – the Eurasianist will double his efforts and fight on! This is the mindset of the quintessential revolutionary-traditionalist. To him, quitting means surrender, and surrendering is an ignoble death. The crucial understanding of the dichotomy and yet mutual relationship between the physical and spiritual realms is at the very core of all traditionalist (and radical traditionalist) philosophies. Indeed, the Eurasianist is one who realizes that there are both positive and negative charges which govern the laws of nature. He understands that there is a great Cosmic scale of justice which is at once beautiful and draconian, ugly and amenable, constantly in flux, but in any case always subject to the immutable rule of balance. Both positivity and negativity are needed (in addition to neutrality) in such a polarized system. The total comprehension and acceptance of the laws of nature is what fundamentally separates the fourth political theory of Eurasianism from the first three inorganic products of Western modernity (liberalism, Marxism, and Fascism). Whereas the rabid liberals and pitifully naïve Marxists look forward to living within the confines of their respective utopian fantasylands, both of which are based on their shared belief in unbridled materialist positivity, and whereas the somber Fascist finds his salvation entirely within the realm of destruction or negativity, the Eurasianist looks far beyond, striving to harness the power of both forces and adapt them in such a way as to provide a utilitarian balance or the best possible outcome for all. Hence the ultimate quest for global multipolarism – a quest which is neither “good” nor “evil” but totally in tune with the laws of nature and thus imperative for the future survival of the human species. And while we are on the topic: What are liberals, Marxists and Fascists but pathetic clowns in the stark opinion of the Eurasianist? What can they possibly teach him about life and the ways of the world? For they all suffer from competing strains of the same spiritual disease: the same solipsism: the same fantasyland mentality! Supine cowardice, self-abnegation, dogmatic enslavement, hatred for other cultures and races – these are the elemental modernist values they embrace, the very foundations of their similarly built edifices. In contrast, the Eurasianist built his domicile on the principles of Struggle, Duty, Loyalty, Heroism, Love and Ruthlessness. His domicile he calls Victory. And so, I say to all of you current and future Eurasian revolutionaries reading this: do not “give peace a chance” as the debauched liberals would have you do, but raise your fist to those who would do you harm. Remember and follow the words of the Messiah (Mt. 10:34): “I did not come to bring peace, but a sword.” Likewise, do not follow the Satanic creed of “do what you will,” but rather will what you do. Neither acknowledge nor trust in any idol or false prophet; only listen to the voice which dwells within – the voice of the Divine. Thus might you also celebrate and fall back on the voluminous wisdom of your ancestors. Without them you would have never been born; eternally they live through you. 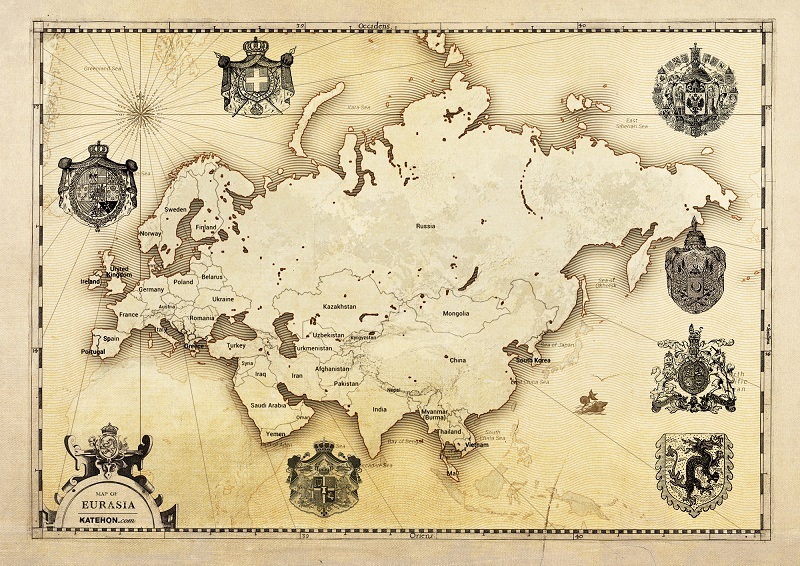 Therefore, look to the innate nobility of your ancestors for inspiration on how to lead your life; utilize the historical examples they imparted as a kind of ancestral map by which to chart your own unique destiny and also the destiny of the greater Eurasian Mission. The venerated peoples whom the Eurasianist claims as his direct torch-bearing ancestors are (among others) the ancient Rus’, the Scythians and Sarmatians, the Persians, Spartans, Romans, Varangians, Mongols, Muscovites, Prussians, and of course the valiant twentieth century heroes of the Red Army. In each of these cultures, the supreme virtues of Struggle, Duty, Loyalty, Heroism, Love and Ruthlessness were most responsible for their corresponding levels of greatness. Truly, each of these cultures transcended the simple Manichean concepts of good and evil. And of course the highest Truth which each of these glorious Eurasian cultures held dear was their Love for kith and kin – love for their people. Everything else was of lesser consequence.